Christchurch Boys’ High School is a boys’ state secondary school in Northwest Christchurch with a proud academic and sporting history dating back to 1881. The school’s main building was completed in 1926 and is listed with the NZ Historic Places Trust. 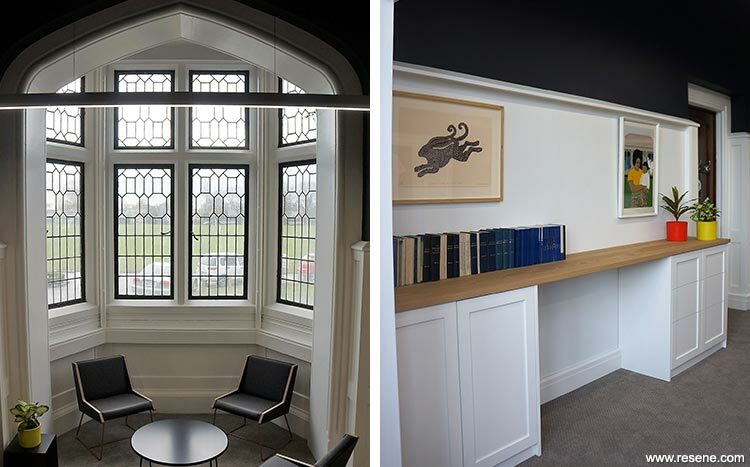 While the original historic building will remain, much of the rest of the school is being rebuilt so the headmaster’s office was redesigned to embody this juxtaposition between old and new. 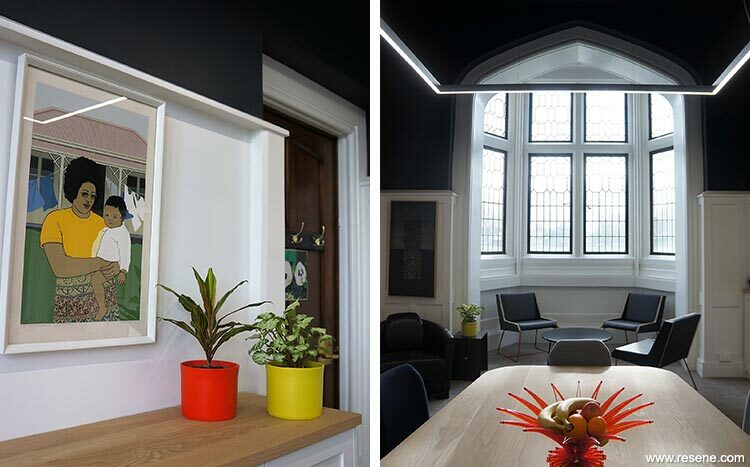 The brief for Thinkspace Interiors was to completely redesign the headmaster’s office, including specifying colours, floor coverings, lighting and furniture, so that the space honoured the school’s and the building’s history and rich heritage, while at the same time reflecting its future as a leading 21st century educational facility. 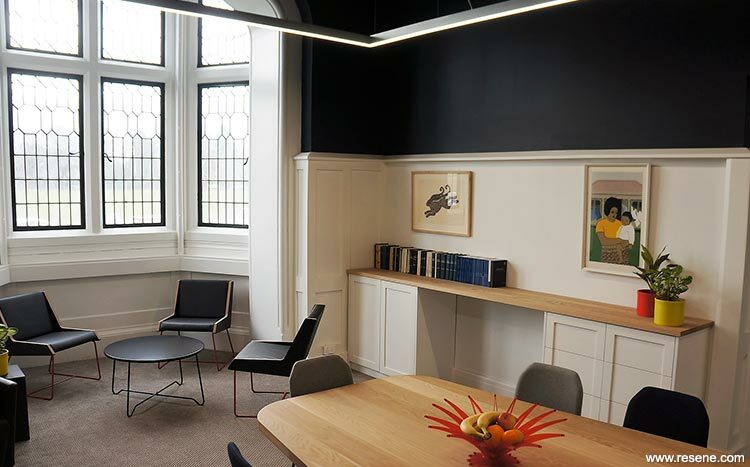 It needed to be a sophisticated yet welcoming environment that would provide a stimulating space for the headmaster to work and conduct meetings with a diverse range of people from parents and students, through to Board members and staff. 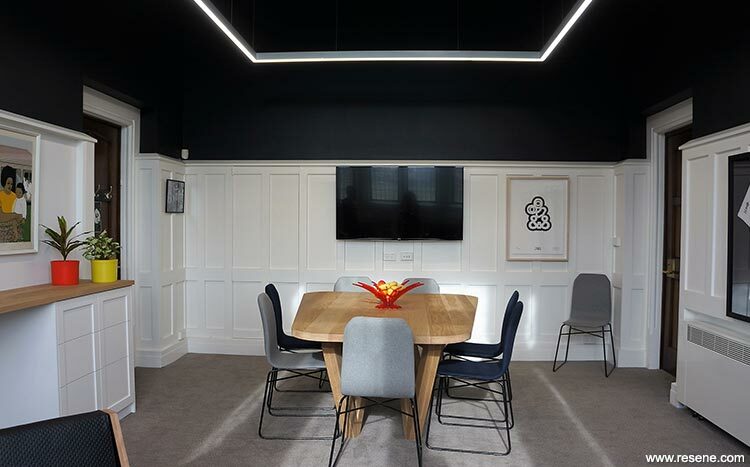 The overall scheme is softened through the inclusion of warm greys in the chair upholstery and textured carpet and through the use of natural American Oak timber in the bespoke hand-crafted meeting table and the timber top of the standing desk and storage units. A high ceiling and stunning architectural components were features that were cleverly exploited and enhanced through the overall design and colour scheme, with strong contemporary elements such as the deliberate choice of furniture and the bespoke light fitting incorporated to create visual impact as well as their functionality. Carefully selected art completes the design. The designers felt that a simple yet sophisticated masculine colour scheme was required and wanted the bold colour contrast between Resene Half Rice Cake (soft white) and Resene Cinder (inky charcoal) to celebrate and enhance the strong architectural shapes of the building. Resene Cinder also represents a combination of the school’s colours, blue and black. The existing timber panelling, door and window frames and new cabinetry were painted in soft white Resene Half Rice Cake. Resene Lusta-Glo oil-based enamel was chosen for its superior durability and hard wearing properties in a high wear and tear environment. The ceiling and walls above the panelling were painted in inky charcoal Resene Cinder. Resene Zylone Sheen was chosen for its quality interior finish and appearance. The dark ceiling provides the perfect foil for the rectangular light that appears to float in a night sky. Additional pops of colour were added with plant pots painted in lime yellow Resene Bird Flower and bold red Resene Guardsman Red. Resene Lumbersider was used for its low sheen, washability and durable finish. 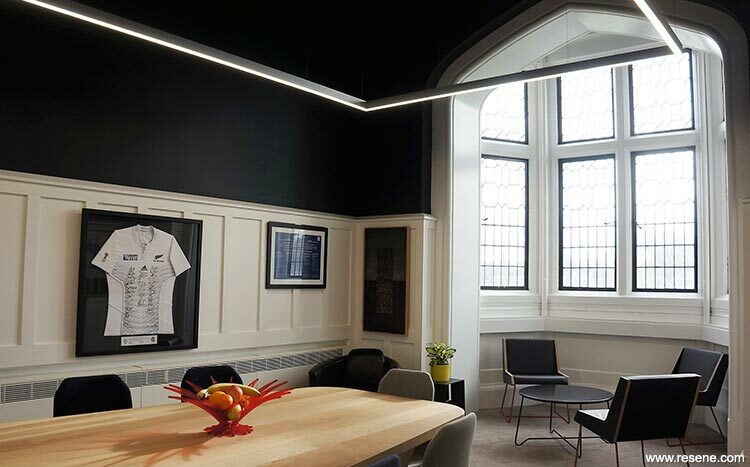 The suggestion to flip the traditional colour scheme of dark timber panelling and lighter ceiling and walls above was embraced by the headmaster but met with a degree of scepticism and resistance by others who felt a charcoal ceiling would close the room in and make it too dark. Those who originally disagreed with the concept have since conceded that the result is stunning and the room feels light and spacious due to the high ceiling, light coloured panelling at eye level and extremely effective lighting. 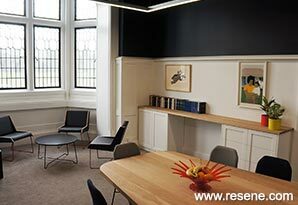 Due to the heritage status of the building, confirmation was sought from the NZ Historic Places Trust that the timber panelling could be painted. As the panelling was not original the painting plan could be implemented as intended.